It’s hard to know when it started. Track back. I remember telling Dad that something was wrong. That was about 2009. Mum was cancelling things. Getting upset. Losing her temper. She also started writing things down. Post-it notes, files, letters, diaries. She’d ask for information to be repeated. She was still using her mobile but her texts were getting less frequent. They’d happen at random times of the day. Often repeating the same thing. One of the last texts Mum sent me was on 27th Dec 2013. I go to meet Mum at the British Museum. She’s there with her best friend, Jill. When I approach, I hear them arguing. About the spot that they were meant to meet at. Mum glares at me. Her eyes are penetrating. Dark. They have this way of holding you. As a child, her eyes worried me. It was as if she could see you all over. Every good and bad thing you ever did. She was this kind of mum. The kind that made you squirm. We stand on the steps of the British Museum. I stare at Mum and Jill. They’re dressed in their London clothes. Handbags. Lipstick. Showerproof coats to shield from the wet. The atmosphere is tense. We walk away from the British Museum. We decide tea would be a good idea. Tea. Mum’s favourite drink. We walk past the shops and make our way down Sicilian Avenue. I glare at her. It’s the first of several shocks. It comes out of nowhere. I turn back to Mum. Watch her as she leans over the glass counter. The same back. The same hair. The same finger pointing for tea and cakes. I hear myself say almost silently, almost without thinking. Mum’s home is in a converted Georgian Lodge. 1 bedroom she uses as a study. 1 bedroom she uses as a spare bedroom. 1 bedroom she uses as her bedroom. Because everything is a fog, Mum lies down, on her pink quilted bed. Feet in the air like turnip tops. Then she turns off the radio. With the radio off, in the silence, because everything is a fog, I get out the ironing board. Then the iron. I begin to tackle the small pile on the chair. The shirts, the nighties, the apron, the tea towel. And because everything is a fog, we try and talk our way through. Mum lies on the bed, blinking up at me, and wondering where it all will end. Because everything is a fog, I sink inside and tell her not to think like that. I look at Mum. And I think to myself, what a stupid question. What a thing to ask. Of all the things, that’s the worst. The dumbest thing. Because everything is a fog, Mum looks at me. We stay still, in her bedroom. Blinking. Lost to ourselves. And each other. And I’m still behind the ironing board. But I’m in the fog, with her. Both of us sinking in it, but still reaching out for sense. Mum rises from her chair. Inch-by-hard-fought-inch. Moves again. This time, furniture walking. Gripping the door. The chest. The backs of things. “Let’s put the kettle on,” she says. We make Redbush. Steam rips from the kettle. We find the cups. Get out the milk. Then we sit at the table. Unbox the pastries. Mixed fruit tarts. Raspberry tarts. Brioche. Mum picks at hers. Peels away the paper. Her glasses are smudged. Fingermarks on the lenses. She eats quickly. She always had a sweet tooth. Mum eats again. We share the pastries. Munching together. Passing back the plates. She gulps her tea. Her forehead has a nick. A blood spot. Tiny. Barely visible. We don’t speak. Lost in the sugar and the cream and the fruit pips. Mum finishes her tart first. Then Mum cracks a smile. Her eyes scrunch. Her lips hold raspberry flesh. We both laugh. The room becomes enormous. Overwhelming. We carry on. My sides start to ache. Mum is beside herself. Red with giggles. In that moment, the illness has gone. Alzheimer’s has no grip. And Mum is unstoppable. She could be 16, or 8, or 25. 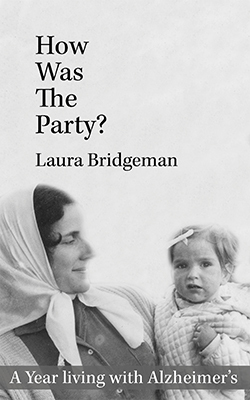 Laura Bridgeman is a writer, editor and lecturer. She runs hotpencil press with Serge Nicholson. 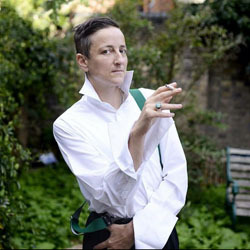 Recent Credits include: The Butch Monologues (In collaboration with Vital Xposure and The Drakes), The (Trans) Mangina Monologues (Hotpencil Press). Caterpillars, Dogfood Diary co-written with Charles Lambert (BBC Radio 4). She teaches Creative Writing at Kingston and Imperial Universities and in 5 UK prisons.